APPG Chair Stephen Twigg MP (Labour) and Henry Smith MP (Conservative) wrote to the Secretary of State for International Development, Penny Mordaunt to request a UK pledge of US$500 million at the Global Partnership For Education Financing Conference in February. 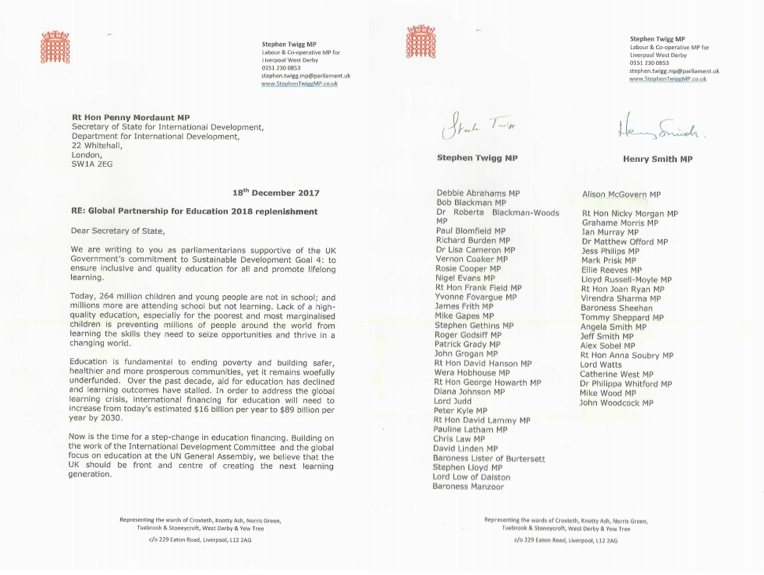 Over 50 MPs from the three major political parties signed on to the letter to show their support for UK leadership on financing education. The letter echoes the Send My Friend to School campaign ask for the UK to increase its funding for the GPE to $500 million at the replenishment conference. The conference will take place in February 2018 in Dakar, Senegal. Here is the letter in full.